The demand for game programmers is constantly growing, but the current education scenario does not serve to create the necessary talent pool. Through the BCA – Game & Mobile Software Development Programme, CMRUniversity is trying to bring about the changes that the game and mobile application development industry now demands. 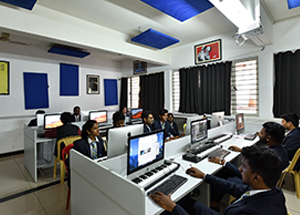 The course will cover topics such as Object Oriented Programming (OOP), C#, C++, AI Programming, Game Designing, Game Engines, Game Physics, Game Product, Game Distribution and Marketing and Human Computer Interface in the Game Software Development component; in the Mobile App Development component, it will include VR (Virtual Reality) and AR (Augmented Reality) Development using C#, Mathematics for App Programming, Distribution & Marketing, HCI (Human Computer Interface/Interaction), Android App Developer, iOS App Developer, Java Programming and Objective C Programming. It will be based on the practice and project model, and will ensure that every student gets to learn and operate under real-world conditions. Placement assistance in the respective industries will be granted to those deserving students who have proven themselves and their abilities. Corporate Social Responsibility, Ethics & Sustainability. The lab is equipped with XBOX having joysticks having access to unlimited games. The lab also has VR glasses and gaming console.